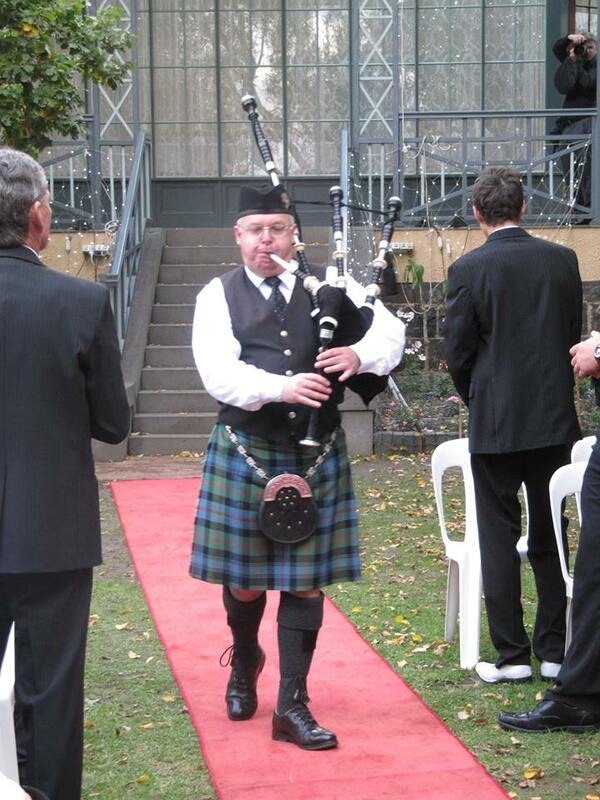 A solo piper at a Wedding is a classic and cost-effective way of providing formal and informal music before, during and after the ceremony. Without the need for amplification, I am easily able to situate myself in an ideal location relative to the guests and the ceremony. I am happy to perform at any part of the ceremony and can recommend suitable music if required. Play an assortment of tunes prior to the arrival of the Bride. Lead the Bridal car into the Wedding venue. Play for the Processional. This involves piping the Bride and or Bridal Party down the aisle. Piping the Groom down the aisle is also an option. Depending on your preference and or the layout of the venue, I may either lead or play from a static position. Play a medley of suitable tunes during the Signing of the Wedding Register. Play during the Unity Candle or similar ceremony. Play for the Recessional. As with the Processional, I may either lead or play from a static position. The music chosen here is usually more upbeat in nature than what is used earlier in the ceremony. Play another assortment of tunes after the ceremony. At the Reception, lead the Newlyweds to their table. Take part in any photographs. Play a variety of tunes for 15 minutes as guests arrive. Play Highland Cathedral for the Processional. Play Flower Of Scotland and Skye Boat Song for the Signing. Play Marie's Wedding and Highland Laddie for the Recessional. Play another variety of tunes for 15 minutes afterwards. Take part in photos if requested. That is just one example and you may wish for for something completely different. I am happy to fit in with your exact requirements and will make every effort to make the bagpipes a special part of your day. Leading the Bridal Party at Overnewton Castle, Keilor.